It’s one of the bitterest rivalries in the industrialized world: Airbus vs Boeing. Despite being world-class companies, executives at each often snipe at each other’s airplanes, claiming superiority in economics and passenger appeal. Like lawyers arguing a court case, data is typically selectively used to advance the claims. One of the most hotly debated issues between the two companies is which is the best single-aisle airplane, the ones that fly the most routes in the world and which carry more passengers than any other type: the Airbus A320 or Boeing 737 families. But the A320 was launched in 1984, 20 years after the 737. A even-up comparison should begin in March 1984 comparing the A320 family with the 737 Classic from then to the end of the Classic’s production run; and with the 737 Next Generation from its program launch in November 1993; followed by the A320neo and the 737 MAX. From March 1984 when Airbus launched the A320 through September, the European airplane has sold more airplanes than Boeing has sold the various 737s during the same period. Both companies have announced hundreds more orders since October 1. Click to enlarge. 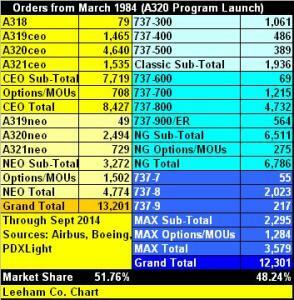 When the count is adjusted to start from the A320’s program launch, Airbus can correctly claim it has sold more A320 Family members than Boeing has sold 737 Classics, NGs and MAXes over the same period. The 737, which entered service in 1968, had a solid customer base built up in the 16 years before Airbus launched the A320 program in March 1984. The so-called 737 Classic (300/400/500) is no longer in production, having been superseded by the 737 Next Generation (NG), launched in November 1993. The NG and the ceo are still in production. Coming from nowhere, with no customer base, Airbus captured 47.5% of the firm orders and 48.9% of the firm orders plus options, letters of intent and memorandums of understanding. Airbus launched its re-engined A320neo (New Engine Option) in December 2010. Boeing launched the 737 MAX. the following July. These each come in three sub-types. Airbus is the runaway-market winner. Boeing points out that Airbus had a seven month head-start on program launch and claims that since the MAX was launched, it’s won 50% of the campaigns. The website PDXlight.com provides an independent look at sales in the days since launch; the A320neo consistently outsells the 737 MAX. The first of the A320neos is scheduled to enter service in October next year. The first 737 MAX is scheduled to enter service in July 2017. Boeing’s dominance in the single-aisle is a thing of the past, and it won’t return for at least another decade and perhaps a decade and a half—certainly not until Boeing designs an entirely new, “clean sheet” airplane and this even depends on the Airbus response. Boeing CEO Jim McNerney, asked about the market share on the third quarters earnings call Oct. 22, maintained Boeing’s long-running statements that it will recover to obtain a 50% share of the A320-737 market. Airbus’ isn’t concerned about the prospect of a Boeing NSA, or New Single Aisle airplane. Kiran Rao, Airbus’ executive vice president of sales and marketing, and John Leahy, chief operating officer-customers, said on several occasions that there won’t be enough technological advances in engines and airframes to support a new, clean sheet airplane before a 2030 entry into service, or EIS. It’s possible that by 2025 an NSA could be designed and into service with 25%-30% lower operating costs than today’s A320s and 737s. But if the benchmark is changed to the new A320neo and 737 MAX, each predicted to be 14% better than today’s airplanes, there is a huge challenge to achieve 25% or better by 2030, let alone 2025. It can’t be done by the earlier date, Rao and Leahy say. “We’re comfortable with the A320neo,” Rao says. Boeing claims its 737-800 and successor the 737-8 are about 8% more economical per seat. Airbus makes counter-claims, but airlines that evaluated the planes and some that operate both the A320ceo and 737NG say Boeing has an operating cost advantage of only 2%. But customers, whose opinions count far more than the hype promulgated by Airbus and Boeing, say the A321neo is a superior airplane to the 737-9 and sales figures support this. On Oct. 21, Airbus upped the ante. Airbus confirmed to the on-line newsletter Leeham News and Comment that it now is offering an A321neo high gross weight that will replace the Boeing 757-200 on 3,900nm routes that are too “thin” for long-range twin-aisle airplanes like the Airbus A330 or Boeing 787 that carry twice the passengers of the 757. Boeing’s 737-9, with a basic design dating to the 1960s, can’t be further developed to match the new A321neoLR (Long Range). The A321neoLR will further marginalize the 737-9. At the low end of the Airbus and Boeing offerings, the smallest A319ceo and 737-700 on their last legs. There have been few recent sales and the backlog for each is winding down as deliveries are made. Their replacements, the A319neo and the 737-7, are largely regarded in the industry as placeholders, rear guard action to serve as a road-block, if one is needed, against the new, clean-sheet 135-seat Bombardier CS300 and Embraer 122-seat E-195 E2. The strategy is more illusionary than real. There are more than 180 firm orders for the CS300 (EIS late 2015 or early 2016) and 50 for the slightly smaller E-195 E2; the latter is still in its infancy, with an EIS of 2019. There are just 49 orders for the A319neo (EIS 2017) and 55 for the 737-7 (EIS 2019). There are two identified customers for the A319neo, Frontier Airlines and Columbia’s Avianca, and 12 orders listed as Unidentified customer(s). Frontier is transitioning to an Ultra Low Cost Carrier and will likely opt for the larger A320neo or even the A321neo, the largest member of the family. Avianca needs the hot-rod performance of the high-powered, light-weight A319neo for its South American service and will probably take the order. The 737-7, on the other hand, is problematic. Southwest Airlines in the USA has 30 on order and Canada’s Westjet the other 25. When the time comes to “cut metal” about 2018, it’s quite possible each will upgauge to the larger 737-8. This leave Boeing in quite the quandary: a 737 MAX family with a good-selling -8, a non-existent -7 and a poor selling -9. At the October European conference of the International Society of Transport Aircraft Traders, a poll was taken of the 1,200 delegates asking if Boeing or Airbus had the more competitive single-aisle airplane. Fifty percent of the audience voted for Airbus; just 23% for Boeing. It’s quite the comedown for the proud Boeing. Airbus has neatly mouse-trapped Boeing. “737MAX8 and 737MAX8-200 are distinct types”. Think about where 737 market share would sit without extreme rebates and higher availability. Are all remaining NG slots already sold ? Indeed I guess that the difference is between the 4 door current A321 that will also produced for 3 quarters in the NEO form, and the Cabinflex A321NEO with the overwing exits that will be initially produced as A321NEO STD and then reinforced and produce as A321NEO LR with “STD” weight options. 737MAX8 and MAX8-200 have different exit layout and the latter need the flat bulkhead. for both airframers we see evolutionary homesteading of select niches with distinct sub²types. What the enumeration further up left out is the high density A321 announced earlier this year. A320HD too, but that one is less of a distinct subtype. We’ll see if the pressure is high enough to have the core types differentiate into some more market nooks. Only France produces on an 11 month basis, Germany and Tianjin are at 12 months per year. what were the prestated numbers for production in 2013 and 2014? According to the chart since 2002 Airbus produced more A320 than Boeing 737. The problem with producing more aircraft are the manufacturers building parts for Airbus and Boeing. These companies also have limited resources and they will produce more parts for the company with the better offer. The distinctive attribute earmarking A32X as the foreloper, trendsetter, Leader vs 73X is the ability of Airbus to periodically wip up the A32X Family’s marketing dynamics to keep the Media focus centered, going NEO, resetting the A321 cabin exit limit, redesigning the aft Galley/Lavatory block, boosting the MTOW of A321 … and there’s more in the pipe to come ! … whilst somehow it seems that the flow of new ideas at Boeing is reaching exhaustion, as if the pressure is ebbing out of the 73X innovation thinktank ? I think it is clear who’s the front runner at this moment. The NEO will have 2 engines that likely will both be more efficient and quieter. Then it has cargo capability and further upgrade potential. NEO being outsold is maybe the biggest MAX selling point at this moment. Boeing will respond long before 2020. Maybe Boeing can take over the CSeries, do the CS500, do a second line and an offer a CFM engine option? Combined with 737-8 and 9 saves the decade and buys time for an NSA. Just an anecdotal comment on Boeing. Just after they lost the Cebu Pacific order, I was drinking with Cebu Pacific contacts and one of the expat guys involved in the negotiations dropped a bomb! Neither A or B offer an armoured cockpit door, and both were asked for the price. By the time Boeing responded, Cebu had signed a contract for the A319’s. I believe this is true, but it reflects an attitude issue with Chicago. With Jetblue, Frontier and other glaring errors of judgement, is it any wonder they have lost market share? I think suggesting an an attitude issue is far too generalizing, there always will be surprises, unforseen developments and different points of view. Sometimes however I’ve been amazed by the steep denial when the writing was on the wall and the use of half truths to create public perceptions. Sometimes I wondered if they were just creating useful perceptions or did not know what was happening. Nose up responses from Chicago all the way, w’re ahead, it will stay 50-50, or better! ..
Maybe Boeing should pay more attention to other opinions, since many prove more accurate then their own. Never flinch. Never appear uncertain. Present yourself as the obvious victor. To a degree this works exceptionally well. Boeing should stop reading their own PR releases, it is one thing to manipulate public opinion, but smart companies don’t believe their own PR! It would be interesting to know which plane family is more profitable for the airlines, although considerably more difficult to calculate. Sales is partly a proxy for that. Of some note, perhaps, would be the total sales of 737-100 and -200 prior to that window (or just mentioning that the frame was designed/laid out in 1964, some 20 years prior to the A320) , and of course the fact that for a substantial portion of the time frame from the chart, there was AT LEAST one other Boeing single aisle offering, which sold over a thousand frames, which shall not be mentioned by name. But it seems that if you are to project forward for A320NEO-LR sales as an advantage, by comparison an equal projection backward to /unnamed-now deceased-Boeing-frame/ would also be fair. Of course, a certain narrow body trijet also ended production in Sept 1984, and there was the 717 production run during the 1984-present analysis as well (just 156 frames but the integration of this sales campaign/winding down certainly impacted considerations for Boeing regarding narrow body updates, again in the post-1984 window.) And these considerations do not address the “Boeing” MD series at all. It just seems a bit simplistic to compare exclusively classic/NG/Max to CEO/NEO absent a mention of how/why the products got to that (starting) point. Boeing and Airbus engage in the debate over whether the 737 or A320 families are the best sellers. None of the other equipment types are relevant to this discussion because Airbus and Boeing framed the debate. Uh, did they really frame up the debate? Boeing made the (correct) claim, which you refer to in the first part of the article, that the 737 has sold in a greater number since than the A320. You countered that claim by making the restriction (also fair, I might add) of only looking at sales from the launch of the A320. But that’s a framing that you made, and not Boeing. In other words texl1649 is absolutely right in his suggestion that sales of the 727 and 757 are also of note in an AvB comparison that aims to be fair. When I go to ISTAT conferences and there are posters by Airbus comparing A320 to 737 to counter Boeing claims, that’s the debate. Since 2002 Airbus delivered each year more A320 than Boeing 737. On each page 100 aircraft. So there are just about 300 more 737 than A320 on duty. – Those pages also include aircraft written off, stored and on order. Use the status filter to see them grouped. The status filter is on. If the 737-7 and A319 are a dying class I would suggest that the 737-8 and A320 are the real, upsized, replacements for the A319 and 737-700NGs currently in use. Capacity wise the A320 goes closer, and you get containerisation as a bonus, so I think Airbus might have an advantage going forward as they maybe cover that market better. I can’t see them wanting to stretch it, as some readers think they should. The real question is,who made the most money,or whose region benefited most economically or from employment.i suspect Boeing, and the U.S. on account of American content in a320.what would you have done differently to Boeing?NSA instead of 787,or instead of 777x.its another very tricky question,there’s always better technology just around the corner.sometimes you can’t just follow on with something better. I just think Boeing and Airbus, in said discussions, should be taken as seriously as consumer advertisers such as Pepsi, Toyota, Ford or Chevrolet. Chevy certainly doesn’t admit that Ford will sell more Mustangs this year than they will Camaro’s (or Firebirds if they could unrealistically bring them back a la 757). But they’re obviously not panicking to the point of replacing the Camaro with an all new model just because it’s now at 40% vs. the Stang. (And in truth neither care about Dodge). Yes these are retail products with 20-40K price tags with much shorter shelf lives than airliners, I know. But I had fun with it, and the Mustang originally came out around when the 737 did, fwiw. One year after the first flight of a Vickers VC10 the Porsche 911 was set free in public roads. US automotive industie is a good example to avoid. Btw, there is a nice museum at Zuffenhausen. The Spyder 918 looks small but very impressiv. Based on order numbers and capabilities it seems that the A-319 neo and Max 7 are almost irrelevant, the A-320 neo and 321 neo will be highly successful for a long time as will Max 8 though perhaps not as long, and Max 9 is marginal. A Boeing Twin Aisle new small aircraft discussed a couple of weeks ago which could replace Max 9 and 757 might be a gamble based on weight, cost and fuel consumption vs. A 321 neo and 321 neo LR but it would offer a radical upgrade in comfort and loading/unloading. A 2-2-2 coach and 1-2-1 first/ business would be a world better than anybody’s 3-3 and 2-2 narrow body. Would people pay a little more to fly on that? I just can’t avoid using the US car industry as an analogy: Look at how GM has sat by too long with their commercial vans and did little to invest in bringing a better competitor to the Mercedes Sprinter. Same can go for Ford with it’s Econoliner. Is this an American thing to squeeze out as much juice with as little investment? Boeing argues commonality but for goodness sakelook at the 737! It’s like the a time warp. They could have at least reengineered a taller landing gear to get a bigger engine diameter. Makes perfect sense. I also get the creeps when I compare the cockpit of a 737 with that of an A320. Sales in the real term is actually sold, i.e. made AND turned over to a customer. Boeing is working up to making more than Airbus so its market share will go up. However, Airbus has an advantage (I believe) they can get more money for their A320 series than Boeing can for the 737s and the knife to the heart of the A321 that Boeing has no answer for. Long term that will hurt Boeing. Granted, with a few miner modifications Boeing could put a 787 wing on the 737 and have a real winner but that is a bit down the road yet. You think that 737-100 grandfathering would survive a CFRP wing ? ( I’d not be too surprised either. The way FAA and Boeing are “interwoven”. The 777X looks like it will be grandfathered from the 777 certification. Two quotations and a remark. Then Airbus can get more money for the A320s Airbus can also pay more to important suppliers. Boeing may build more airframes but what’s the value of a 737 without e.g. seats? The single aisle freighter market is not so big. That’s what Leeham did here as well. Also, if you care to compare actual numbers delivered, Airbus has consistently out-delivered Boeing in the narrowbody world for more than the last decade (as has been pointed out before). Another point – which I’ve made to you before – is that if you want to predict numbers delivered 5 years from now, orders are indeed your best bet. If manufacturer X engages in more overbooking than manufacturer Y, you still have a good-enough data basis at this point to be able to see by how much orders and actual deliveries diverge, i.e. you can take this overbooking into account and adjust your projections accordingly. On that point – if you do believe that Airbus does more overbooking than Boeing, do present your analysis that shows and quantifies this and we can continue the debate on that. However, it would still be very hard to overcome the fact that Airbus has been out-delivering the 737 quite consistently for a good while now. I think it’s intellectually dishonest to not allow orders as a major parameter when trying to predict deliveries 5 years from now (because it’s only deliveries that count), while allowing planned (!) production increases to influence one’s projections of market share (based on deliveries) in the future. Using that approach, a lot of Soviet airliners would have long overtaken Boeing and MDD before the 737 Classic ever even took to the skies. As it stands, Airbus has more orders for NEO than Boeing does for MAX – and Airbus in 2018 certainly has enough A320 FALs to be able to increase production rates as well; so there is currently no reason to believe that, based on numbers actually delivered, the market share of NEO vs MAX will be substantially different from the market share currently seen in MAX and NEO orders. That would be one oversized wing, unless you mean “787 technology wing”. In either case – not a minor modification, and thus not something we’ll ever see in real life (nor will we see an A320 with an A350 technology wing). The 737 frame has already been pushed as far as it can go economically. Adding a new wing and new engines in 10-15 years’ time, the modifications required easily amount to development costs that will warrant doing a from-scratch design instead that will be much more optimised than 2030 wings, materials, engines, landing gear stuck onto a 1960s fuselage. Isn’t that excatly what the 777X represents? IMU keeping the original Alu wingbox ? What I am arguing is not long term, planning etc or overbooking between one or the other. The real market percentage is aircraft made and turned over to a customer. The so called “sales” backlog and percentage is indicative of where they are going, no argument there. You might just as well call it “Aircraft Futures Market” (certainly when its more than a few years out). That should be carefully evaluated on a year to year basis to see what the reality is. To be ridiculous, an A320 sold in 2025 is irrelevant to a 737 sold in 2015. You can look real good if your sales are moved out that far because you can’t produce enough to meet the need, but no one has a clue what we will have in 2020. If Boeing works up to 60 a month and Airbus makes 50, then Boeing has a %54 percent of the Current year Market. Yes they do have to know what the so called sales are in the future, but that is internal planing and not external. I don’t disagree that Airbus has made more than Boeing and their % is higher. If Boeing can make and sell the 60 a month (roughly target for the future) then that is the real market percentage. Down the road, its a different story, but right now, actual fact looks to be Boeing will make more than Airbus. That can change as well. Economic advantage is all Airbus as is a better airframe to sell currently and into the future. I have repeatedly said the 737 should have been replaced a generation ago, Boeing is in a single aisle hole, the A321 puts them in deeper. The high production plan is short term desperation. On the other hand, if you need a single aisle in the near future and Airbus can’t deliver it to you, then a 737 in the Air is worth a lot more than an A320 sometime down the road (and in numbers needed for fleet operations. Also future sales can be terminated by simply not making your payments (or deferring). Its a shifty nebulous item. Current production that is sold is real. So what you’re trying to say, in a few more words, is that Boeing has announced a higher production rate than Airbus has so far, so based on that, their market share will be higher. a) Airbus can increase their production rates as well. b) If you have 40% of orders but 60% of actual production output… you’ll either be producing white tails, or you’ll be ploughing through your backlog a lot more quickly than your competitor. That’s a pretty big if, and it doesn’t even take into account that Boeing could indeed reach 60 a month, but Airbus still surpasses that production rate. Down the road, its a different story, but right now, actual fact looks to be Boeing will make more than Airbus. And it looks like they’ll thus just empty their backlog more quickly than Airbus will (assuming Airbus don’t increase their production as well, which I suspect they will). True, but that’s already factored into prices and production slot availability anyway. Also future sales can be terminated by simply not making your payments (or deferring). Its a shifty nebulous item. Not really. Airbus and Boeing have been in business for a while and we have a pretty good idea how many cancellations they’ll see on average. As do Boeing and Airbus themselves, who allow for these when booking slots. Current production that is sold is real. You were just talking about the announced production rates which in your view favour Boeing, now you’re saying “current production” is the only thing that’s real, which brings us back to my original points that a) current production sees Airbus ahead and b) current production alone isn’t a good indicator of future performance. In 2014 Airbus delivered a grand total of five more a320s than Boeing did 737s. This slim lead will likely disappear in 2015. Boeing had a sales advantage of over 100 in wide bodies which is where the real profits are. Regardless a shorter backlog will indeed help sale 737s and sales are where money is made and can be plowed into the enormous task of starting a clean sheet design. Boeing delivered 114 787 … at >$30m loss each. In theory you are correct. But Boeing turned all the wrong screws : Increasing immature production is one of those money voids. Project accounting allows to cloak that away though. is Boeing strategically trying to run out the 737 backlog as quickly as possible in order to manufacture a downturn/layoff/shutdown at Renton in order to be able to more easily put manufacturing for the 797 in a more “business friendly” state? on the other hand, Boeing has about an 8 year backlog at projected production rates, so maybe they are just trying to not poison the well by talking about the 797 before the -Max even flies…. Very far sighted. Quite plausible given the facts…it makes serious business sense on ground (assuming it is not a change in strategy by Boeing as it had probably already acknowledged an already lost cause in this class/size of aircraft)! I think absorbing and believing Boeings statements on 737 production rates and a 2030 replacement is a choice. Lets leave it at that. No doubt is there, A320 family proofs to be much more popular among world airliners than B737 family. Boeing has to recognize that. i think this story is made by a pro-Airbus and lacks a lot of real technical data, anyway is just your opinion. Where lies the country of Columbia? Never heard of it. Avianca is the flag carrier for Colombia. obvious spelling errors aren’t really worth a discussion. Wow, that´s a late reply now. But just to make it clear. That was NOT a spelling error. Half of English speakers tend to get this beautiful country´s name wrong. It just shouldn´t happen, especially here. Great article anyway. Found it again after a year and half. Another way to tell the difference between these two jets is by sound. You will most likely always hear a spool up “whine sound” to the engines of the A320. Where as the 737 in any variant lacks this sound. The space inside is also a factor as the A320 “trumps” pardon the pun the 737 in that area as well. It’s a no wonder why i prefer flying on JetBlue who only uses Airbus A320’s and a few Embraer 175 and 190 variants. As opposed to SouthWest who solely uses 737’s particularly the 500 & 700 variants. A320’s in my opinion are a far nicer plane by far to travel on.